Overweight... AND OVER IT! : What If? Why do we place ourselves in a box, believing we can only do what's normal or easy? What holds us back from moving in the direction of our dreams? Who or what has influenced the way we progress, or don't, towards them? 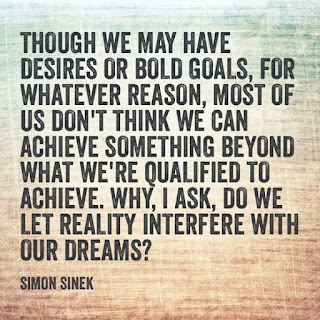 Are we willing to change what we've been settling for to make our dreams come true? Discovering the answers to these questions could be the difference between living our dreams or continuing to settle for a life of "wouldn't it be nice". We all certainly need some amount of money to provide for ourselves and our families. And to achieve our dreams, funding is typically needed. This creates the need for a job. There are times we have to take the job we can get to make ends meet, but that doesn't have to be the end of the road. I see it as a starting point! A friend shared this video on Facebook this week and, after watching is, my heart was changed. I immediately looked at my dreams, my future, and the message we're sending to children in a new way. How would you answer the question "What if money didn't matter?" You're SO welcome! I'm really glad it spoke to you. Great post...far too often we let others and ourselves box us in....time to kick down the walls. Thanks Jason! I agree... let's put our kickers on and BUST SOME WALLS DOWN!!!!!!! !